Write short note on Gouraud and Pong shading technique. OR Explain Gouraud and Pong shading along with their advantages and disadvantages. Question: Write short note on Gouraud and Pong shading technique. OR Explain Gouraud and Pong shading along with their advantages and disadvantages. In this method, the intensity interpolation technique developed by Gouraud is used, hence the name. The polygon surface is displayed by linearly interpolating intensity values across the surface. 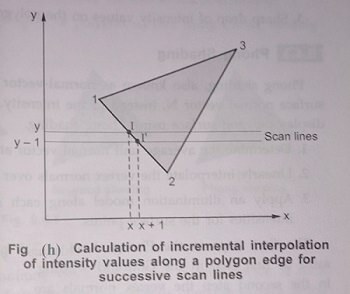 Here, intensity values for each polygon are matched with the values of adjacent polygons along the common edges. This eliminates the intensity discontinuities that can occur in flat shading. By performing following calculations we can display polygon surface with Gouraud shading. 1. Determine the average unit normal vector at each polygon vertex. 2. Apply an illumination model to each polygon vertex to determine the vertex intensity. 3. Linearly interpolate the vertex intensities over the surface of the polygon. We can obtain a normal vector at each polygon vertex by averaging the surface normal in all polygons sharing that vertex. This is illustrated in figure (f) below. 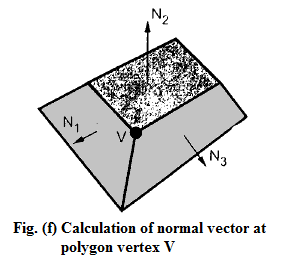 where n is the number of surface normal’s of polygons sharing that vertex. The next step in Gouraud shading is to find vertex intensities. Once we have the vertex normal’s, their vertex intensities can be determined by applying illumination model to each polygon vertex. Finally, each polygon is shaded by linear interpolating of vertex intensities along each edge and then between edges along each scan tine. This is illustrated in figure (g). During the scan conversion process, usually incremental calculations are used to obtain the successive edge intensity values between the scan lines and to obtain successive intensity along a scan line, this eliminates the repeatative calculations. It removes the intensity discontinuities exists in constant shading model. It can be combined with a hidden surface algorithm to fill in the visible polygons along each scan line. Highlights on the surface that are sometimes displayed with anomalous shapes. The 1inear intensity interpolation can result bright or dark intensity streaks to appear on the surface. These bright or dark intensity streaks are called Mach bands. The mach band effect can he reduced by breaking the surface into a greater number of smaller polygons. 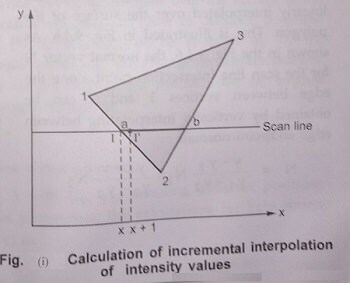 Sharp drop of intensity values on the polygon surface cannot be displayed. Phong shading, also known as normal-vector interpolation shading, interpolates the surface normal vector N, instead of the intensity. 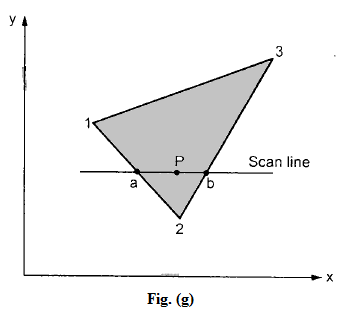 By performing following steps we can display polygon surface using Phong shading. 2. 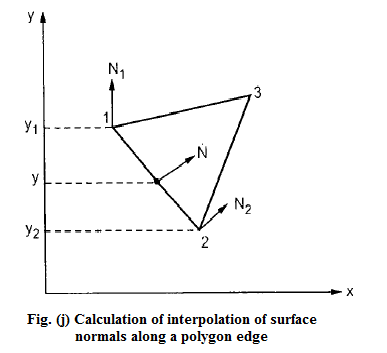 Linearly interpolate the vertex normal’s over the surface of the polygon. 3. Apply an illumination model along each scan line to determine projected pixel intensities for the surface points. I. It displays more realistic highlights on a surface. lt greatly reduces the Mach-band effect. It requires more calculations and greatly increases the cost of shading steeply.